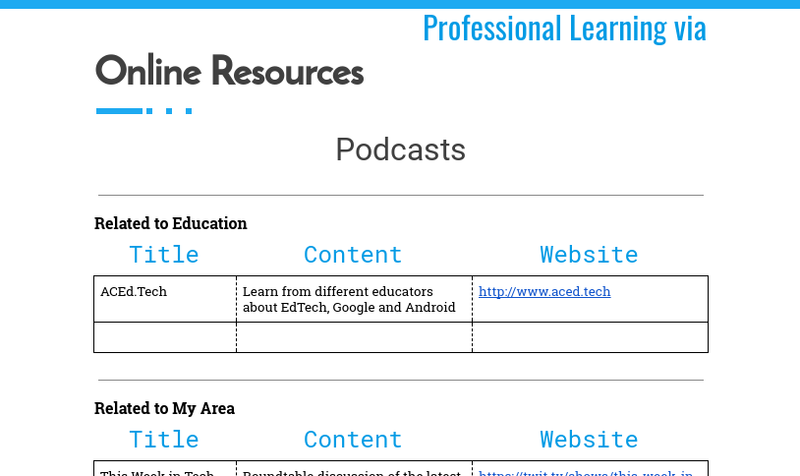 Listening to Podcasts and Other Online Learning Resources are Considered Professional Development. This tracker will help. This document will help you keep track of your online learning. You can provide this to your supervisor (Administrator) as evidence of Professional Development. Podcasts are a popular resource, however, Blogs (like this one), Vlogs (like YouTube Channels), and other resources are also a part of your professional development. Check out the preview and how to use it will follow. Each state is different. I have provided standards for Texas Teachers (T-TESS) as an example. Some tables will have example rows. You can Insert or Delete rows by clicking on a row and opening the Table menu (as shown on the preview). You can delete sections you don't need by selecting the heading down to the blue line and hitting delete. In the Replace with box, type in your Department, Subject, etc.